Ellen R Wald is a historian, policy expert and business consultant. She is the author of “Saudi, Inc: The Arabian Kingdom’s Pursuit of Profit and Power,” a book on the history and strategy of Aramco and Saudi Arabia. Wald is also president of Transversal Consulting, an energy and geopolitics firm. Transversal Consulting utilizes a network of scholars and experienced professionals to provide facts and analysis to industry leaders. Wald is a graduate of Princeton University (AB history, Near Eastern studies) and Boston University (PhD energy history, foreign policy, Middle East). She has taught international relations, Middle East history and policy for a decade. She has held academic appointments at the University of Georgia, the American Heritage Center at the University of Wyoming, Boston University and the University of Cambridge. 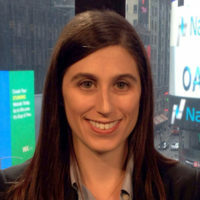 Wald has written in academic and policy journals, financial and energy trade publications and general media, including the Washington Post, The New York Times and CNBC. She has provided expert commentary on radio and television on three continents. She regularly speaks on oil markets, energy innovation, international business in the Middle East and geopolitics. She can be reached through TranversalConsulting.com, ellenrwald.com or on Twitter @EnergzdEconomy.